Connect the HDMI and USB cables. 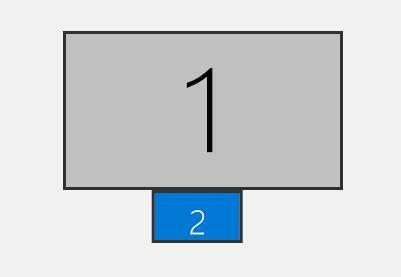 Turn on your PC and the display will show a second windows or mac desktop. The image displayed on the GNS430 will be inverted, to correct this you will need to adjust the display settings. With the cables connected, open the Windows Display settings. You should now see a smaller box that represents the GNS430 display. If you are unsure, click the 'Identify' button to confirm which display is associated with the GNS430 device. Click on the GNS430 display (number 2 in this example) and change the display setting for the smaller display to “Landscape / flipped”, leave the resolution set to whatever Windows says is recommended, usually 1280x720. It is usually best to 'place' the GNS430 display below and to the center of your primary display. This makes it easy to adjust the GNS430 to exactly fill the display however if you have multiple other displays, this positioning may need to be modified. To hide the bezel graphic and ensure the GNS430 only displays the screen content you need to override the default settings. Download this file (right click, save as), and place it in the following folder. Note the file must be named exactly as "Garmin_430_2d.png"
Start X-Plane and load the default Cessna 172SP. With the default 3D cockpit view selected, click on the virtual GNS430 screen so that it ‘pops out’. Note the background may look strange, look for the small rectangle in the upper right and click this to make the window appear with the white bar at the top. Now position the window so that it fully fills the GNS430 screen. If you position the GNS430 display below your primary display, just drag it down so the only the white bar is visible in your primary display. You may need to adjust the width/height of the popped out window slightly. Try pressing the buttons on the GNS430 and you should see screen change. If you don’t see anything changing, you can check that the GNS430 is connected by checking the connection status window in "Plugins -> RealSimGear GNSx30 -> Connected Hardware". You can also check out this video from X-Force PC that describes the complete setup process. Note this is for the GNS530 product but the process is essentially the same.